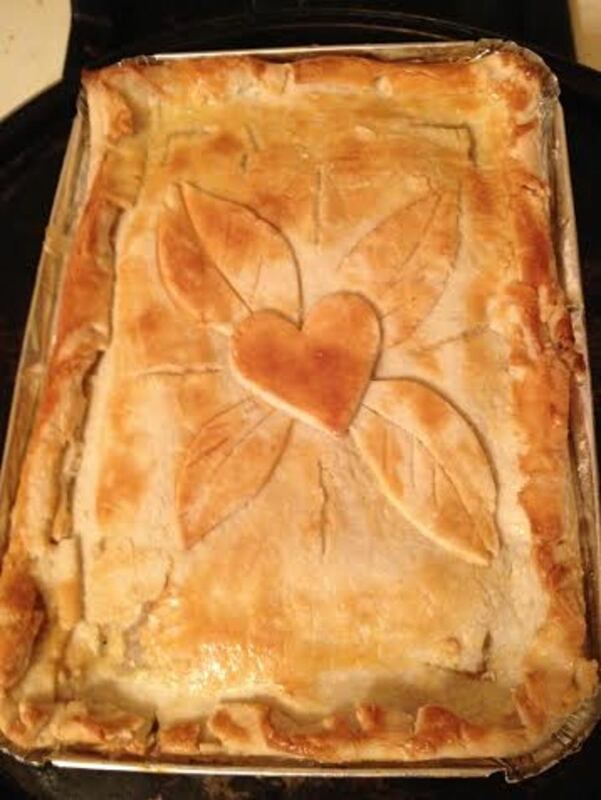 4.3 stars from 7 ratings of Homemade Healthy Chicken Pot Pie! I love cooking and I love homemade food. 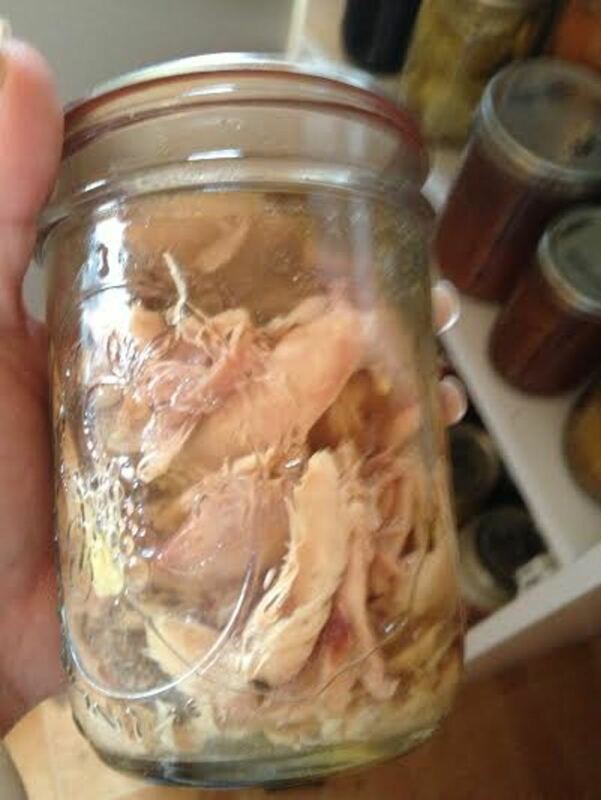 When I say homemade, I mean food that is really homemade with no shortcuts out of a can or a box. 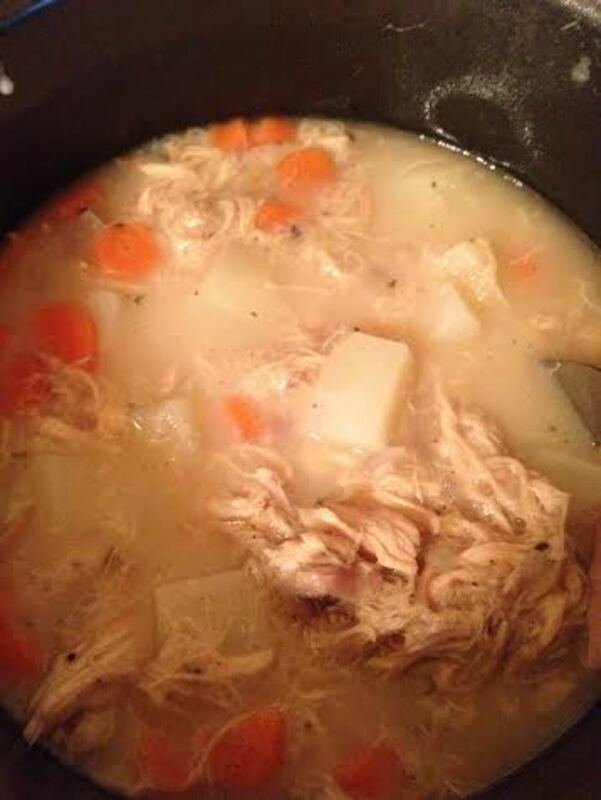 There are thousands of recipes out there for "homemade" chicken pot pie and whenever I searched for one, I was always horribly disappointed to see ingredients like cans of cream of whatever soup, a packet of some type of soup mix or canned vegetables that have been sitting in a soup of BPA for who knows how long. This recipe is all real, fresh food. Just the way we like it. 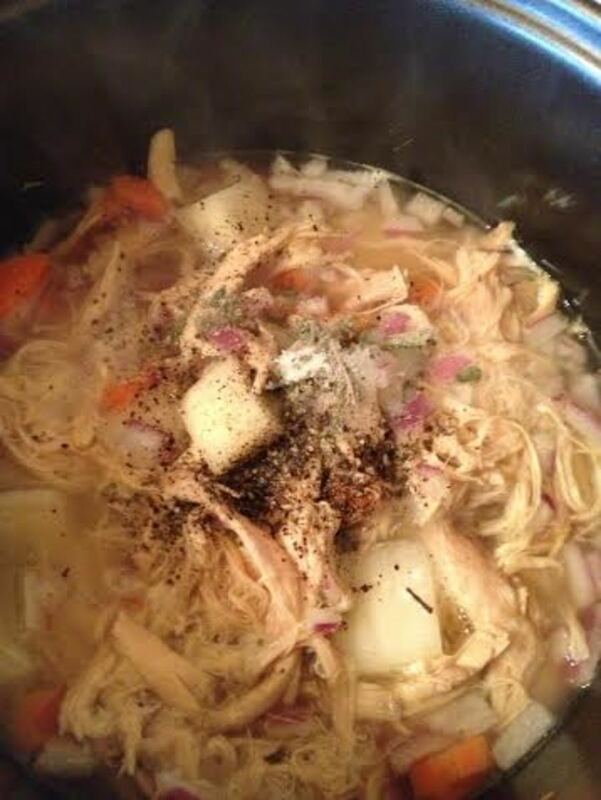 I developed this recipe over a little bit of time, trial and error. 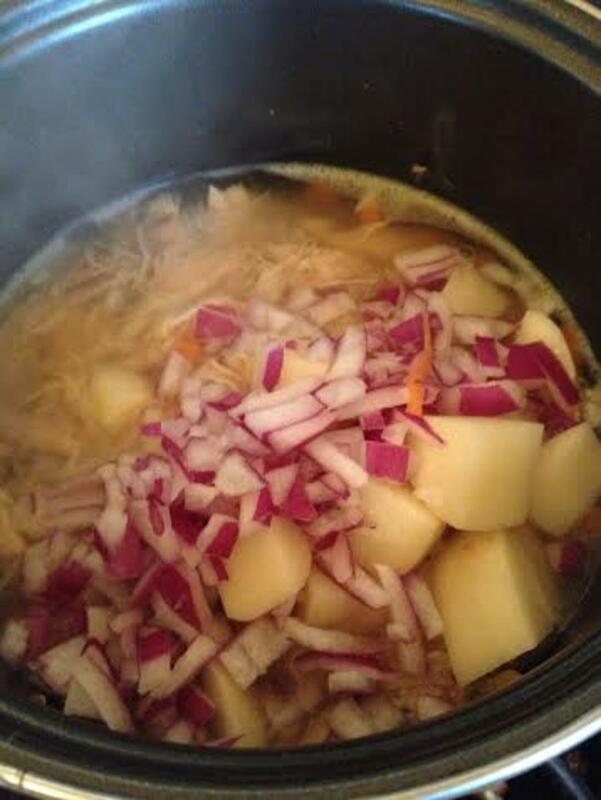 This recipe was made in a recyclable aluminum 4" by 8" pan that is 2" deep. 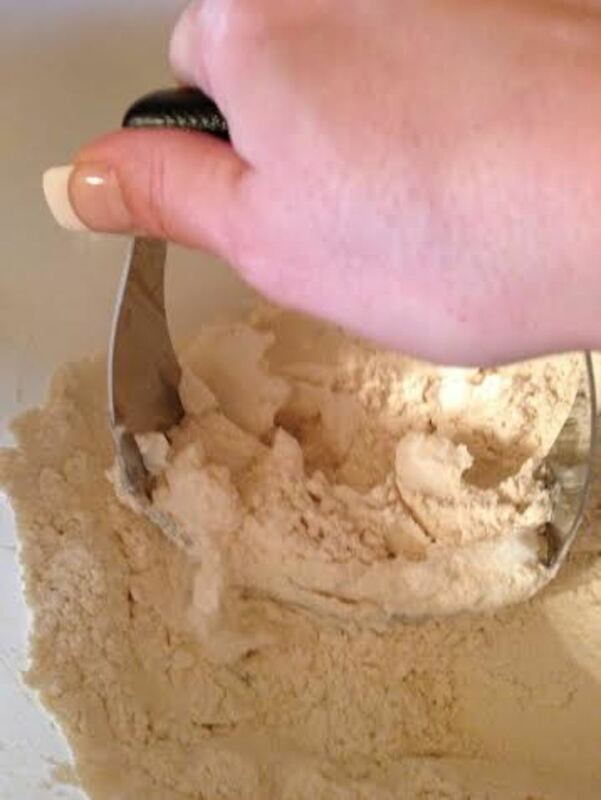 Measure out the 1 1/4 cups of flour and put it into your mixing bowl. 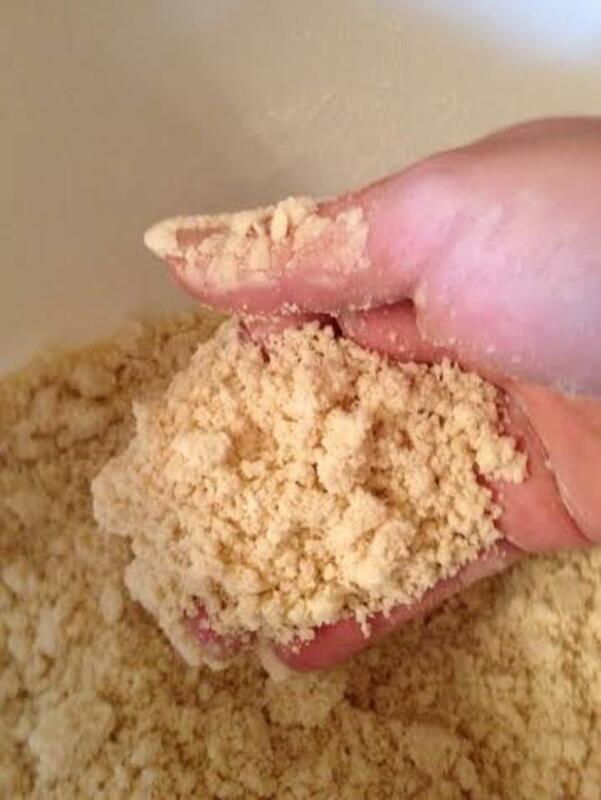 Add the salt and stir until the salt is mixed thoroughly into the flour. 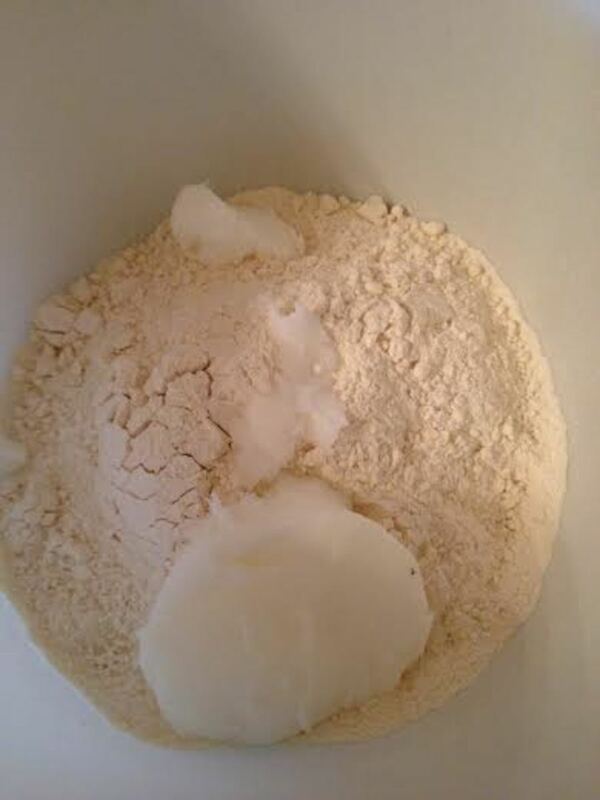 Measure the 1/3 cup of shortening or lard and add it to the flour. 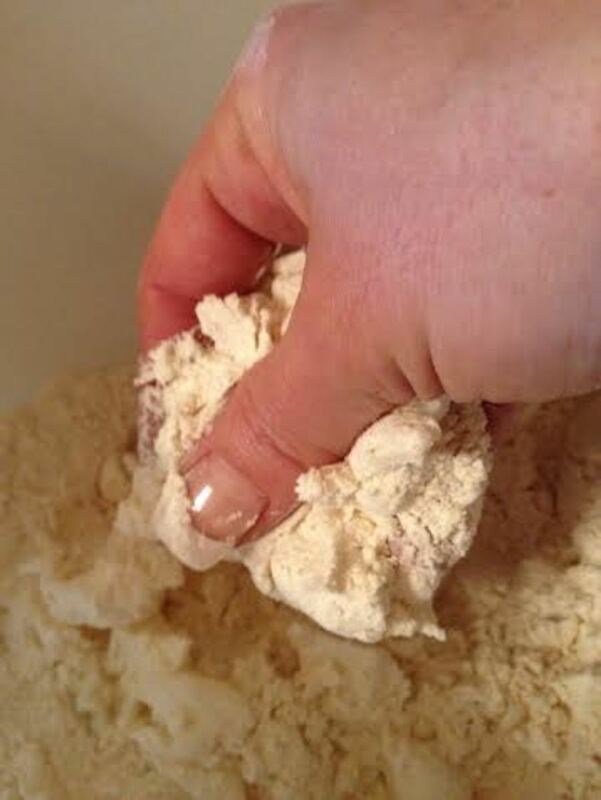 Using either a pastry cutter or your fingers, work the shortening or lard into the flour until the mix resembles small crumbly peas. 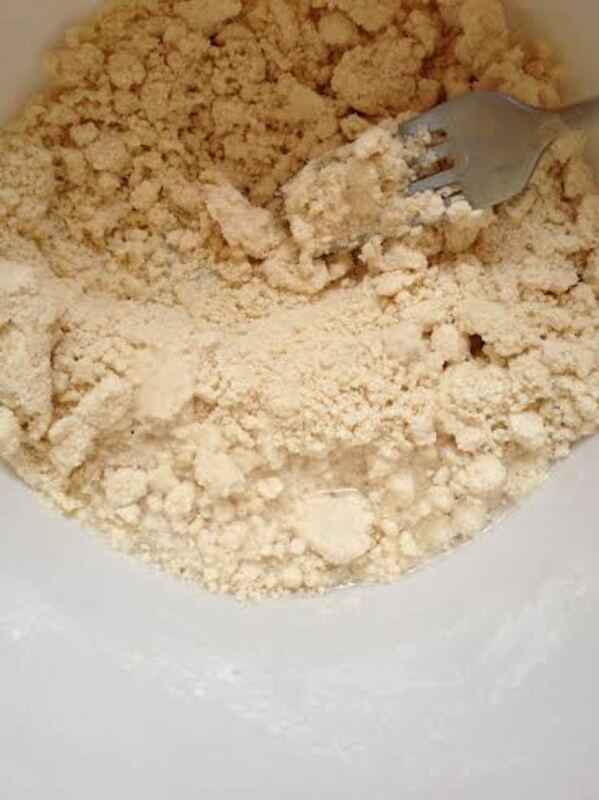 Add the water 1 Tablespoon at a time mixing it in by pushing the flour around with a fork. 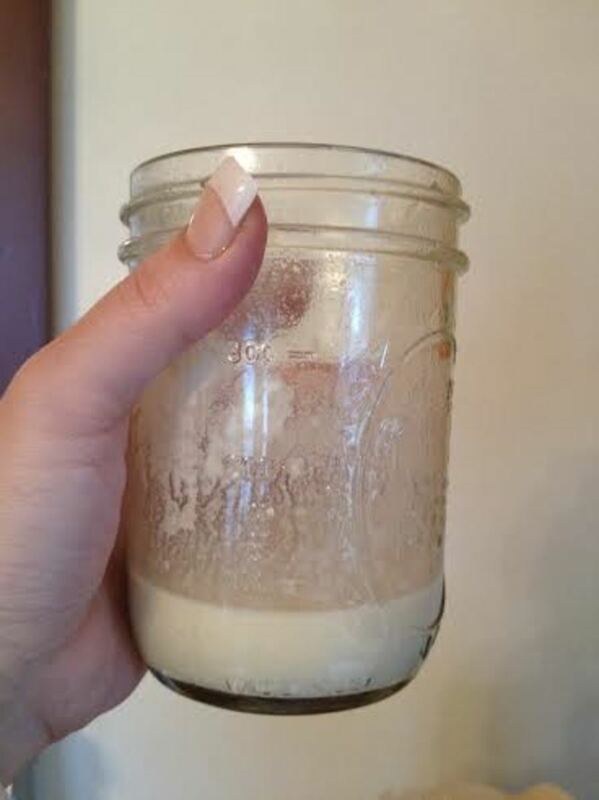 Sometimes you will need 3 Tablespoons and sometimes you will need 4, depending on the humidity in the air at the time you are making the crust. 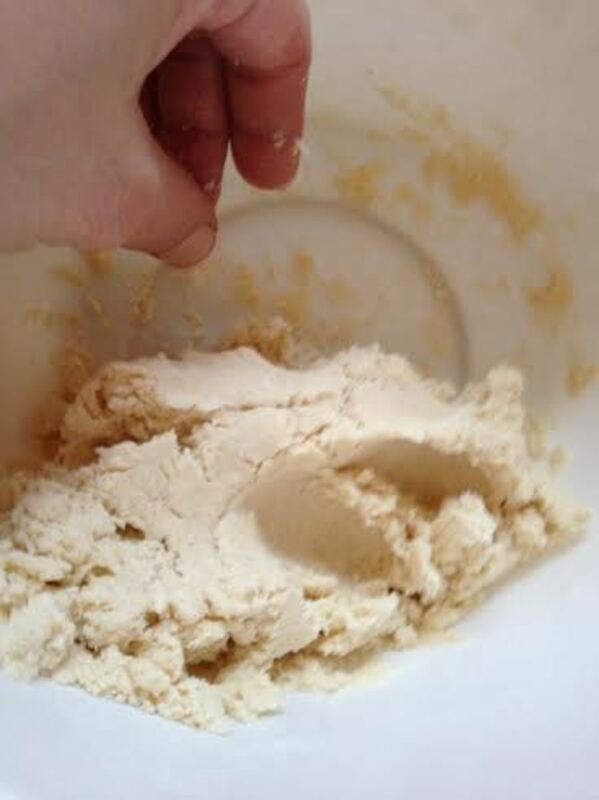 Once you have added the water and the dough starts to come together, form the dough into a ball. It shouldn't feel dry or crumble when you touch it but it also should not feel wet or sticky. 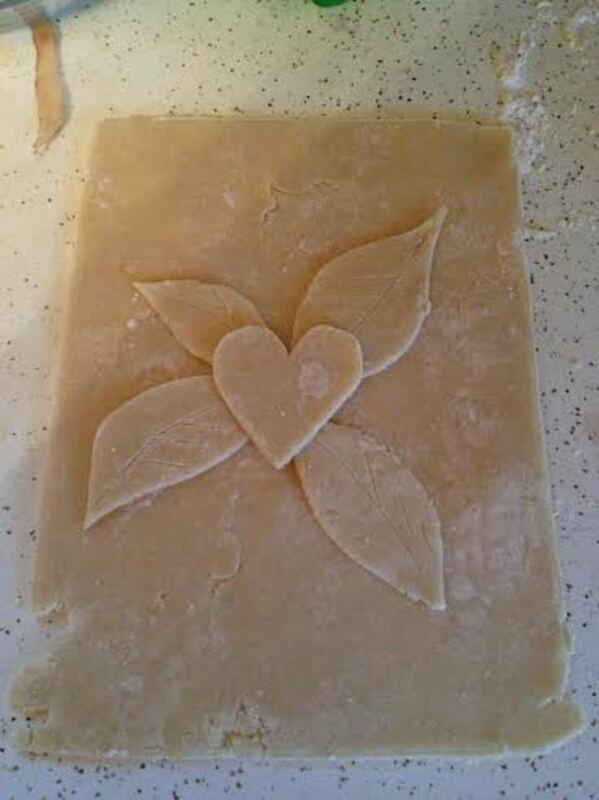 Turn the dough out onto a floured surface and start rolling with your rolling pin. 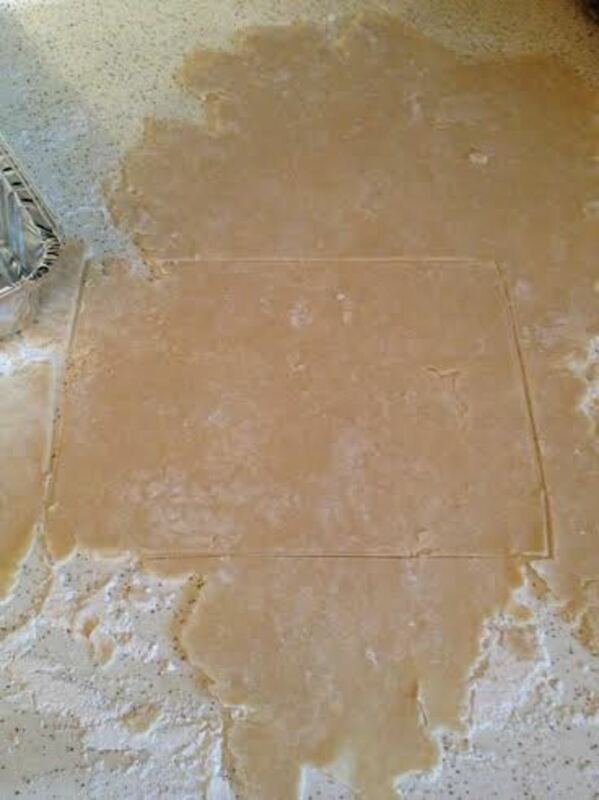 Roll out the dough until it is right at 1/4" thick. 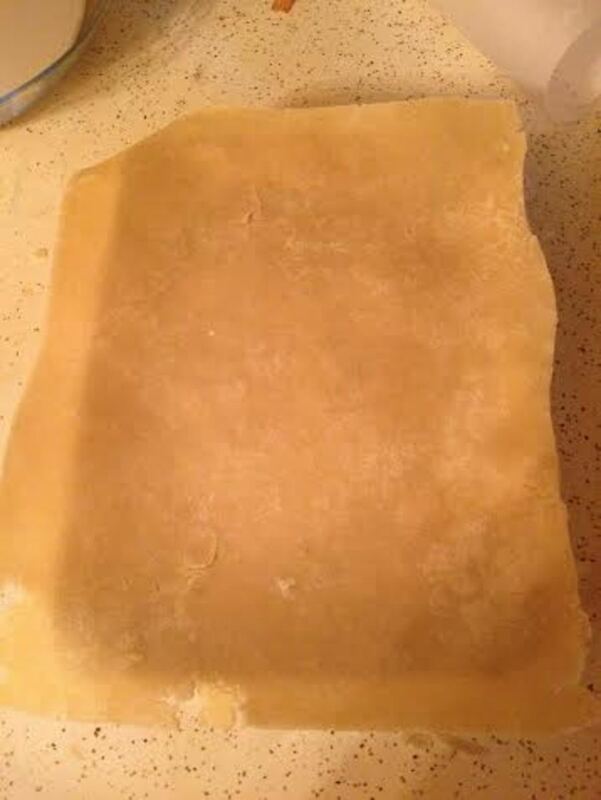 I like thinner crust and this thickness works perfect for meat pies, in my opinion. 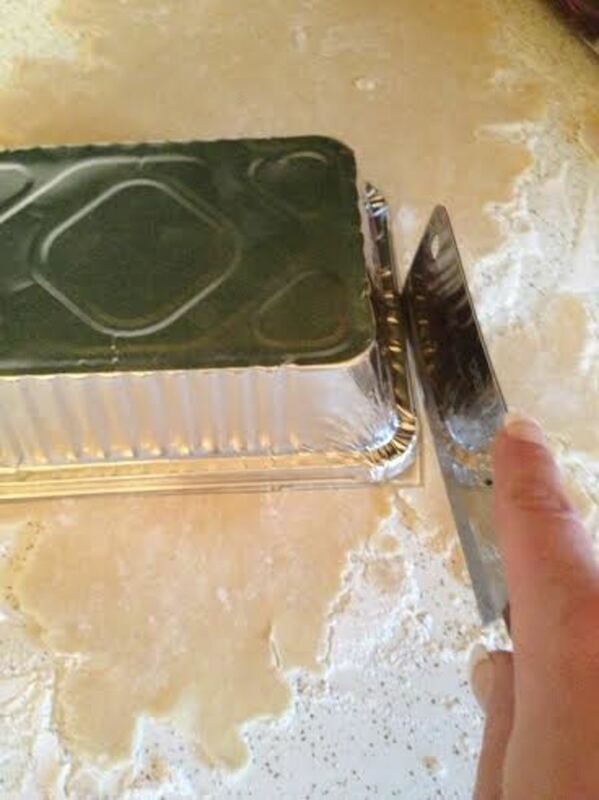 For the top crust, hold the pan above the crust and cut out around the edges. Make sure that you have the pan on the edge of the crust so you will have another, slightly large piece to line the inside of the pan. Set the top aside and square off the remaining dough for the bottom crust. 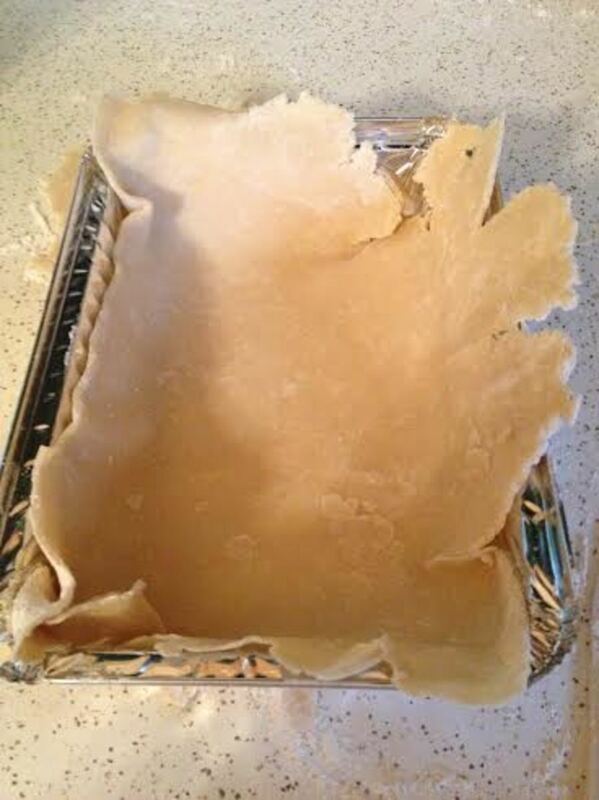 Pick up the bottom crust by rolling it onto your rolling pin, then unrolling it onto the pan. The dough will cave into the pan and all you will need to do is lightly pat it down into the pan. Use small pieces of leftover scraps to fill any holes that might be there. 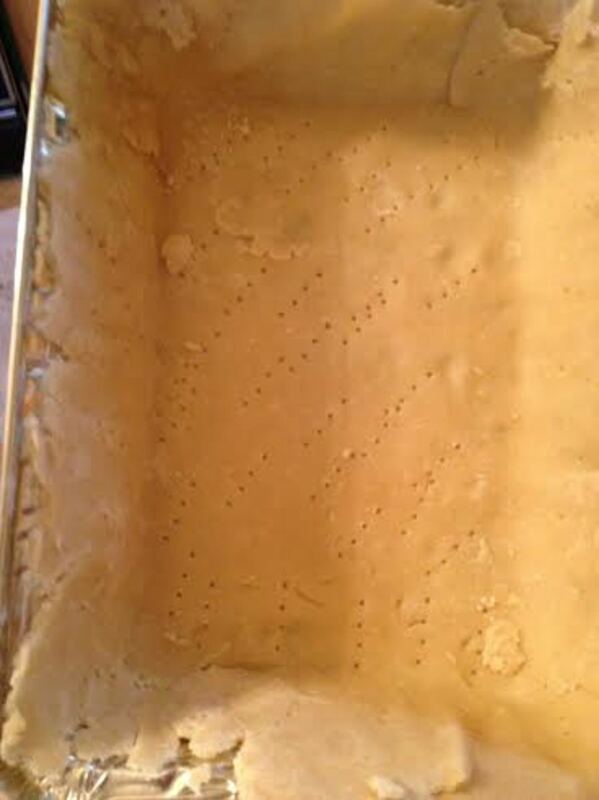 Pierce small holes in the bottom and on the sides of the crust that is in the pan with something like a fork. This will help keep the crust from bubbling up when we par bake it. 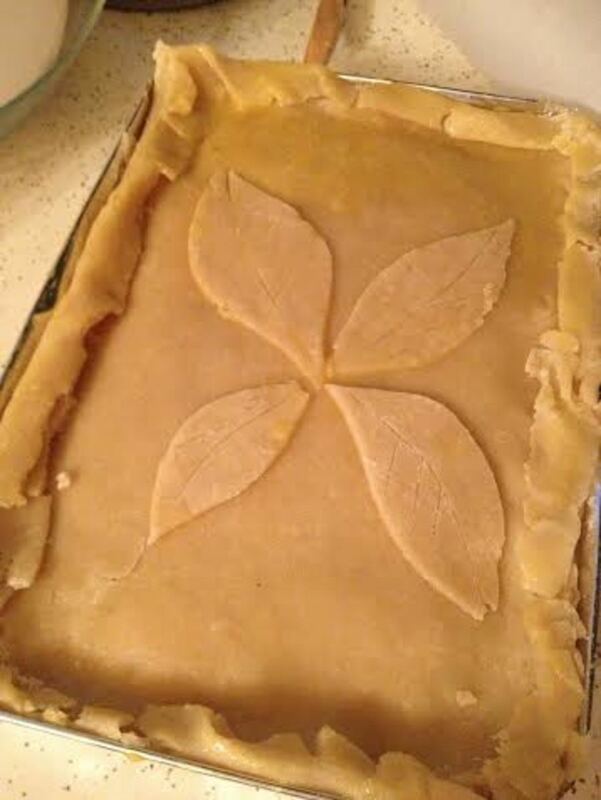 Cut a piece of parchment paper to fit inside the bottom crust. 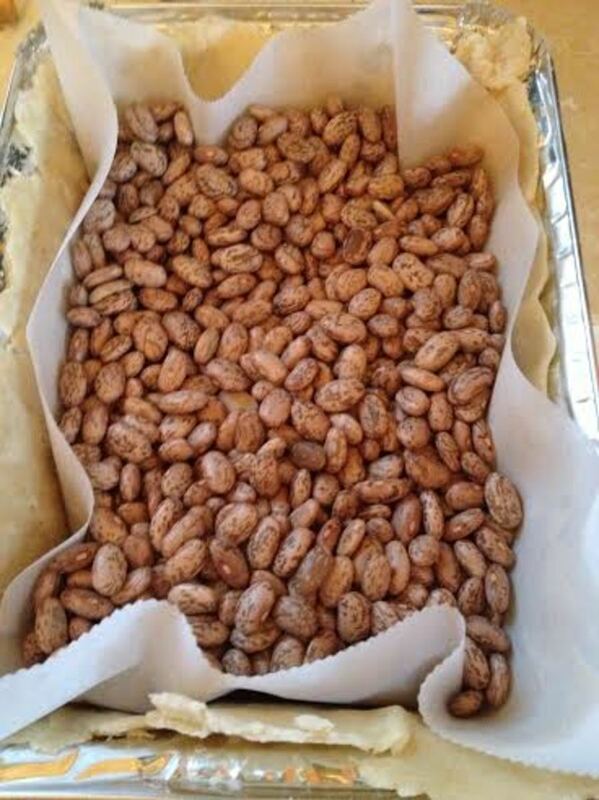 Use beans, clay marbles, rice or something else that can stand the heat to weigh down the crust. 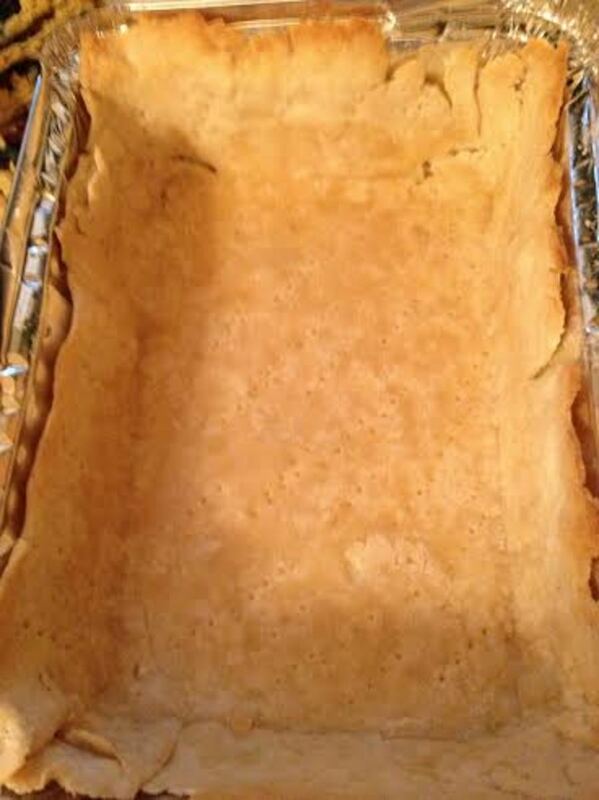 Par-bake your crust in the 450 degree oven for approximately 12 minutes or until the edges start to brown. 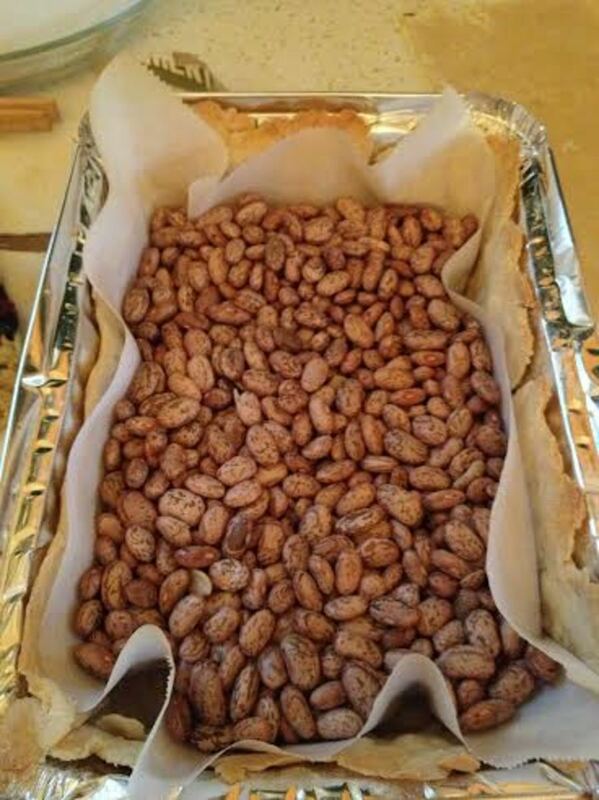 Remove the crust from the oven and let it sit to cool off before removing the parchment paper and whatever you used to weigh it down. 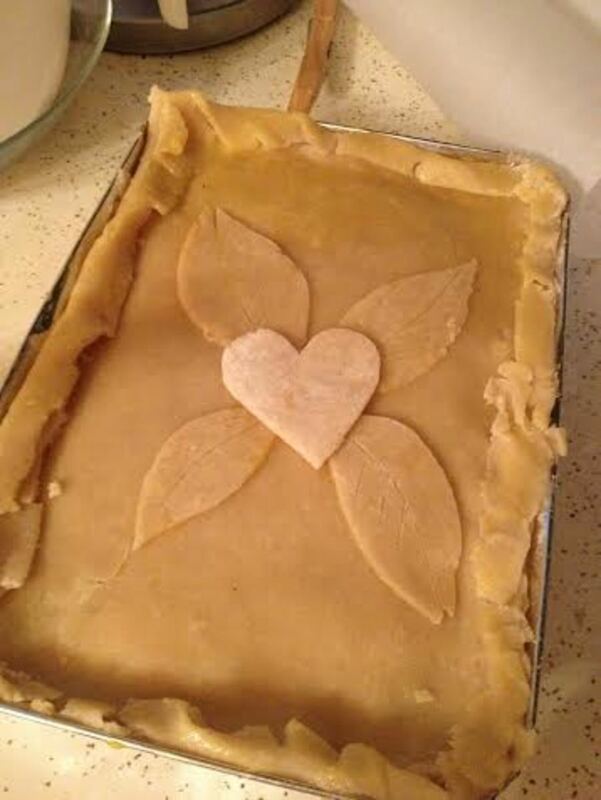 Use the leftover scraps to cut out any design that you might want to put on top of your pot pie. 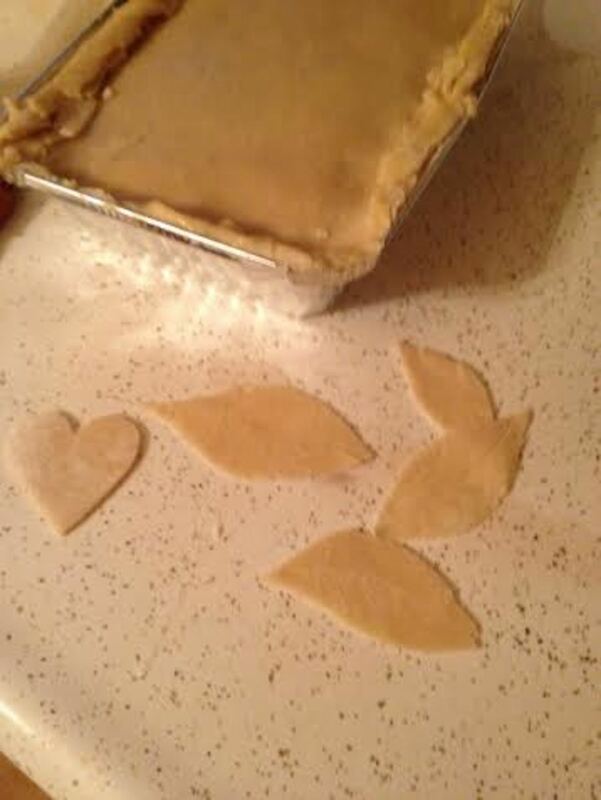 I cut out 4 leaves and a heart shape to finish mine off but you don't have to. The first thing I need to tell you is that if you want cubed pieces of chicken, do not add it until the end. 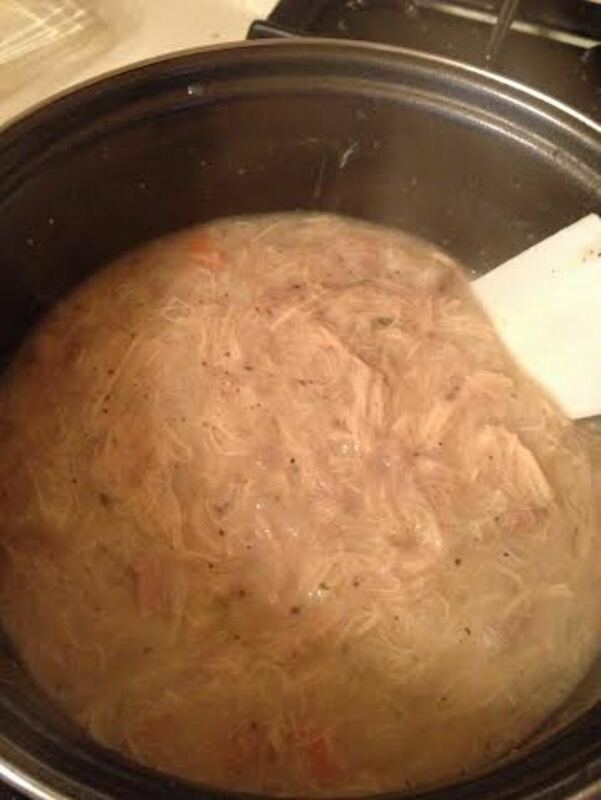 We like our chicken shredded so we put ours in with the broth so it shreds while it is being stirred. 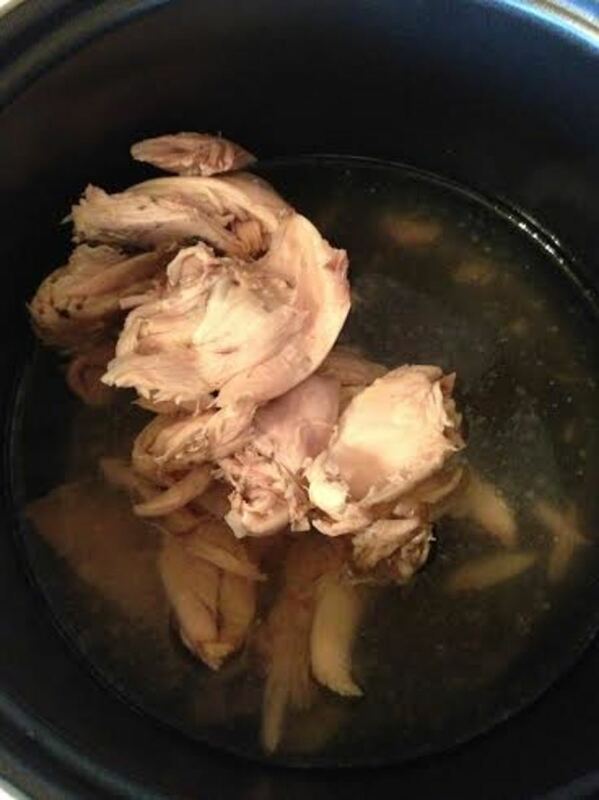 Put your 2 cups of chicken broth and 2 cups of water into a sauce pan and turn the heat on medium. Allow it to warm up. 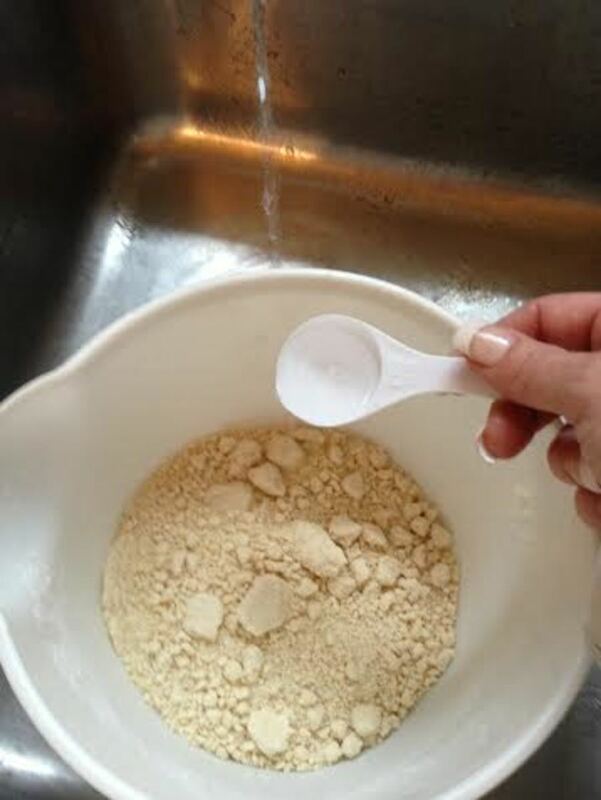 In a separate bowl or cup, put 1/2 cup of water and mix in the 4 Tablespoons of flour. 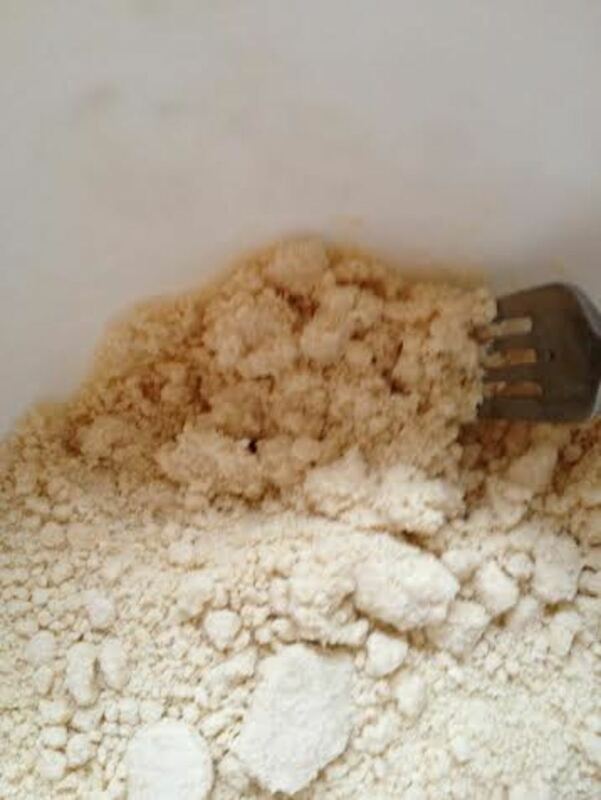 Mix this thoroughly until there are no lumps and set it aside. 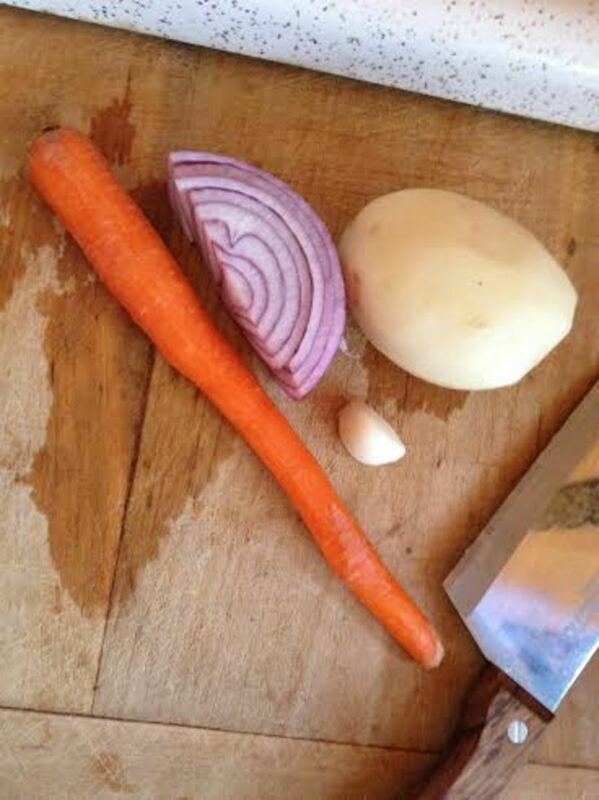 Add the chopped carrot and the onion. Let the mixture cook for about 5 minutes, stirring occasionally. 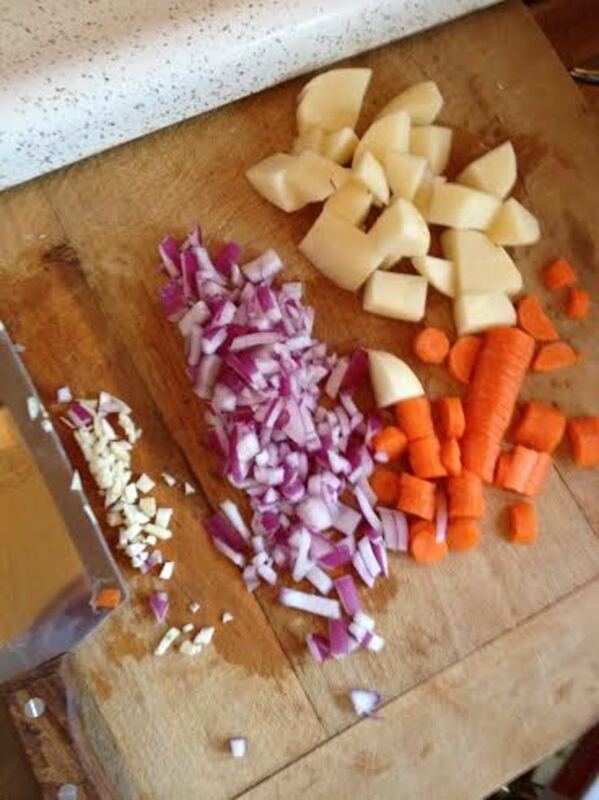 Add the potato and onion and while stirring occasionally, cook until the potatoes and carrots are almost done. 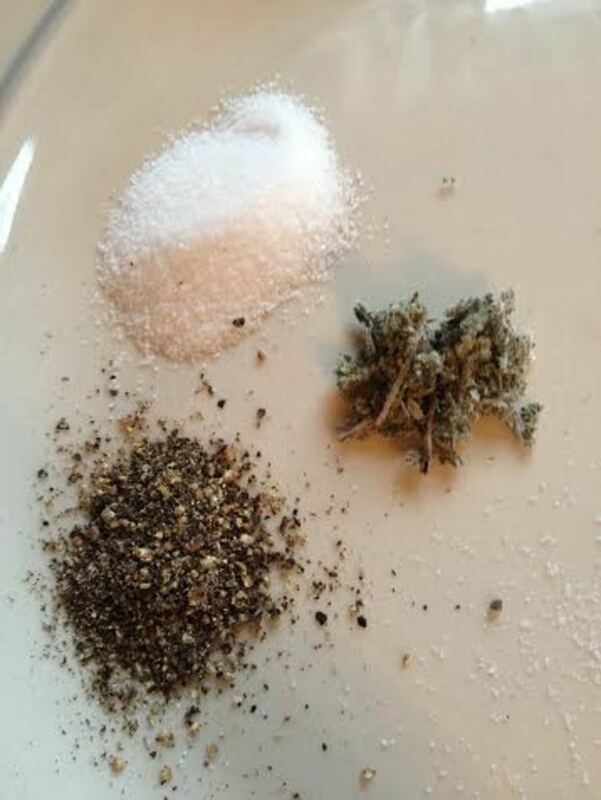 Stir in the salt, pepper and sage. 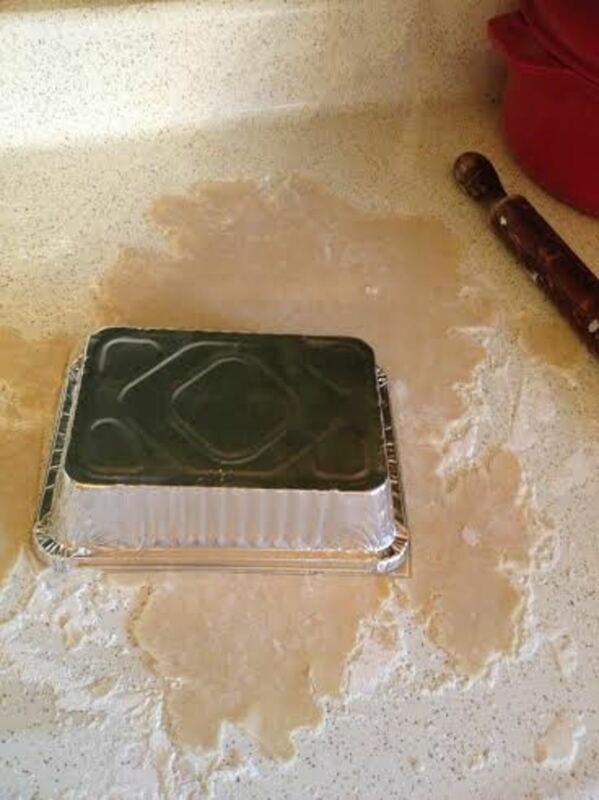 Now you are going to want to add the water and flour that you mixed together earlier. You let it sit for a while so you'll want to stir it to make sure it is well mixed. 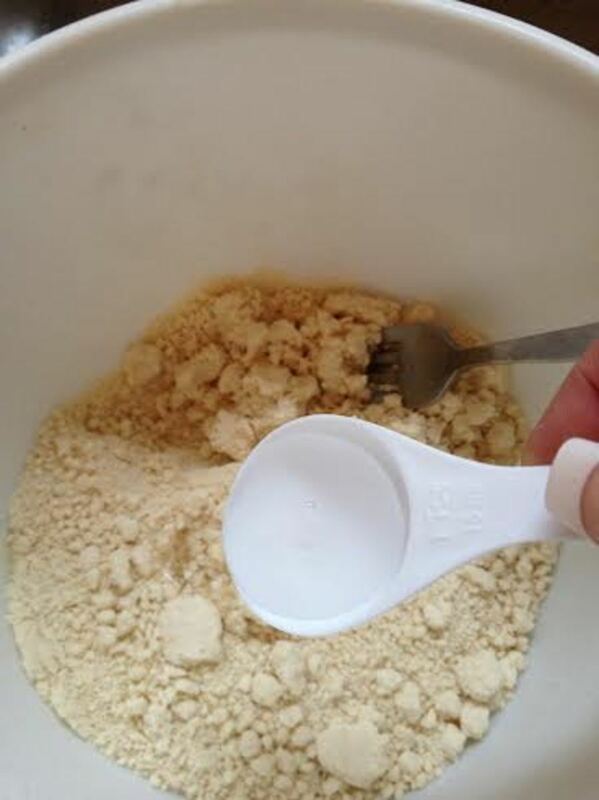 Pour the flour mixture into the filling while constantly stirring. Keep stirring over medium high heat, being careful not to allow any of the filling to burn. It will start to thicken up. If you chose to keep the chicken in cubes, you'll want to add them now. 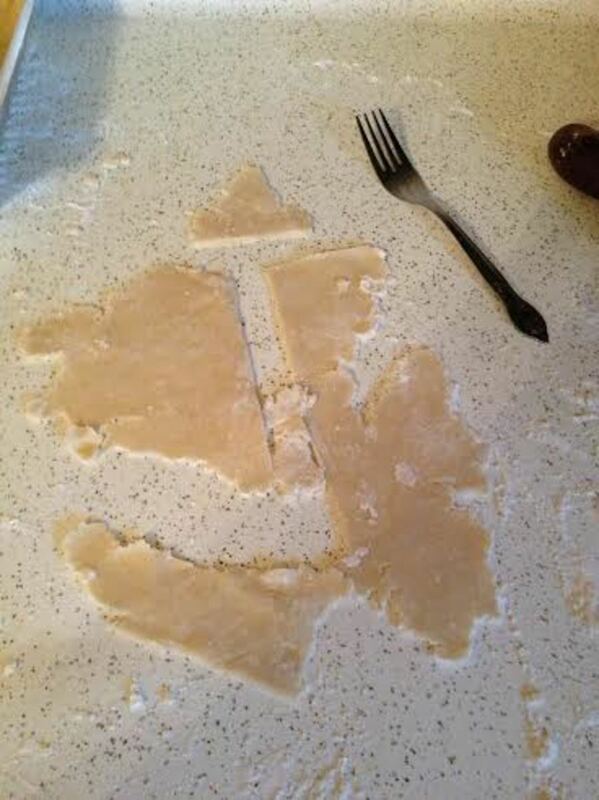 Your filling is now ready for assembling your pot pie. 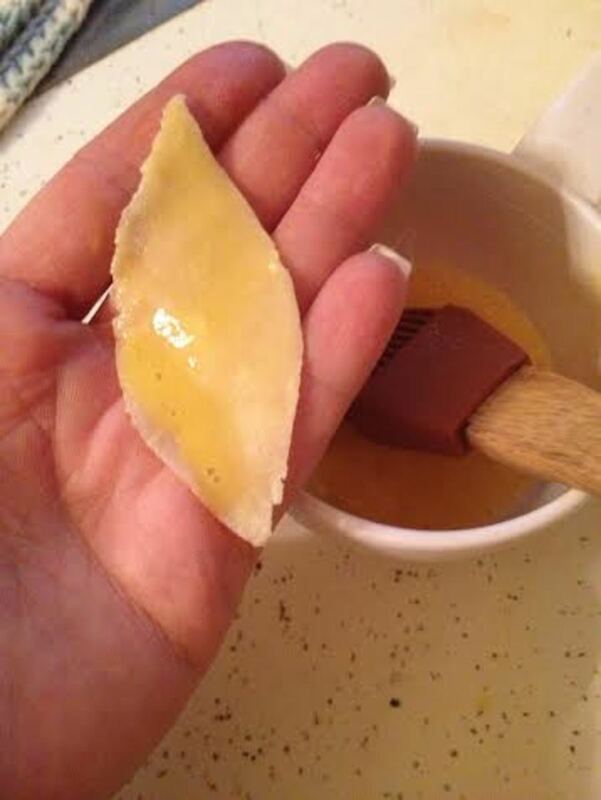 Once the filling is thick and hearty, you will want to pour it into your par-baked homemade pie crust bottom. Roll the top crust one more time to stretch it out just a little bit more. 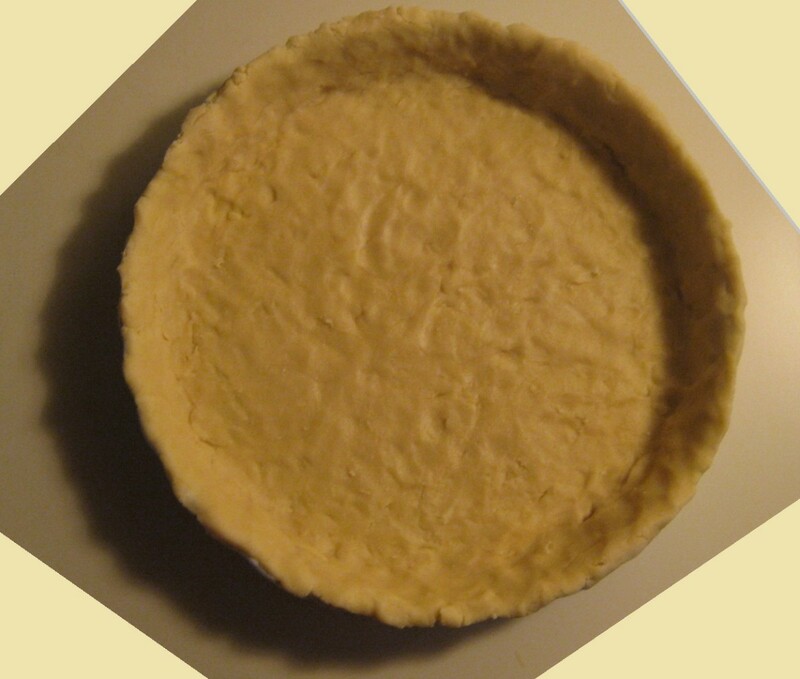 Roll the top crust onto your rolling pin and unroll it onto the filled bottom crust. You have a lot of options for the edging. I just folded this one over but you can make any type of decorative, or not, edging that you feel like. 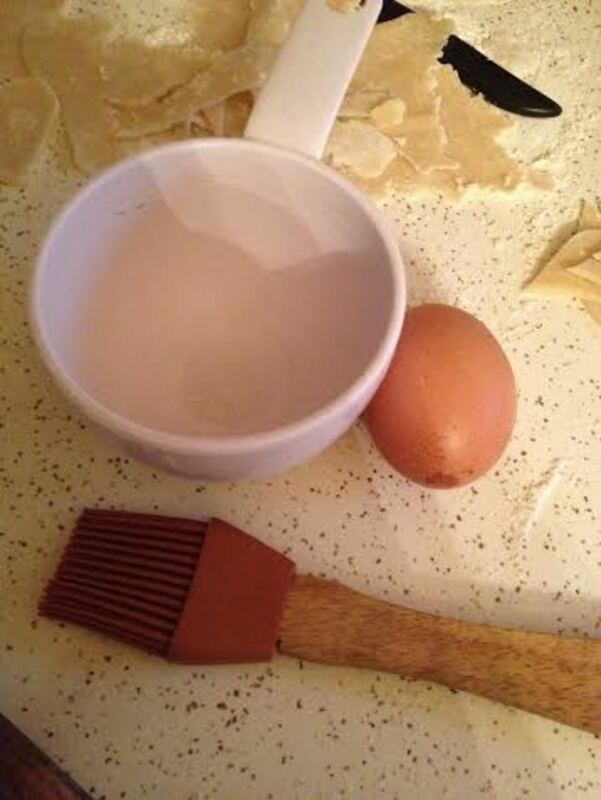 Now you will prepare the egg wash. 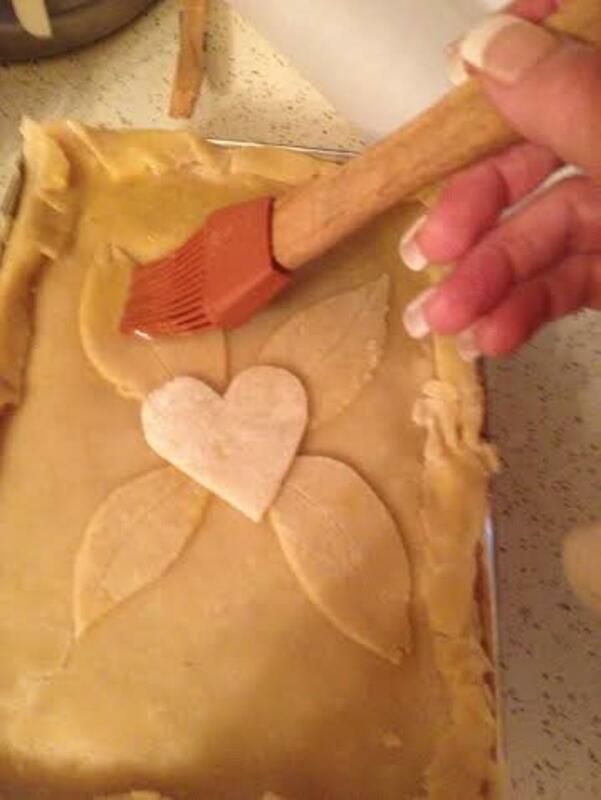 The egg wash is what makes the crust shiny and acts like a glue for applying your decorations that you made earlier. 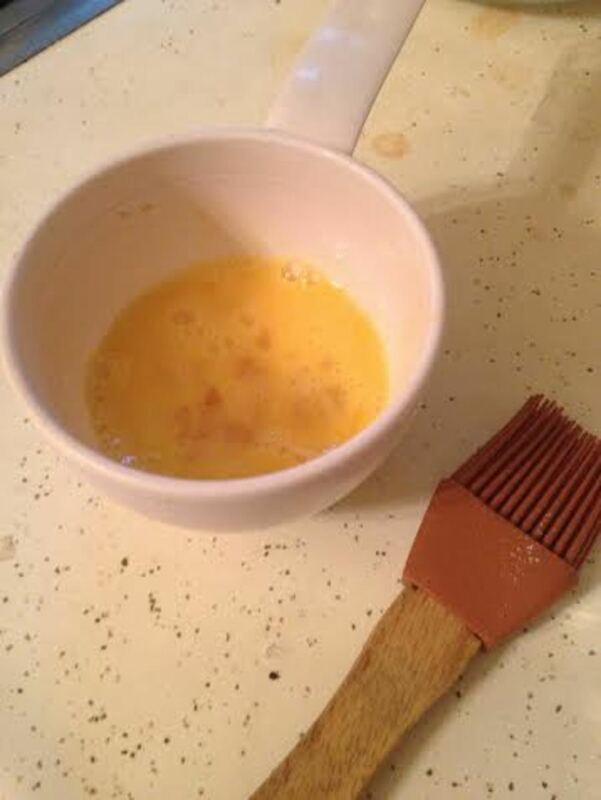 Crack and egg into a small bowl or measuring cup and whisk it until the yellow and white are nicely combined. 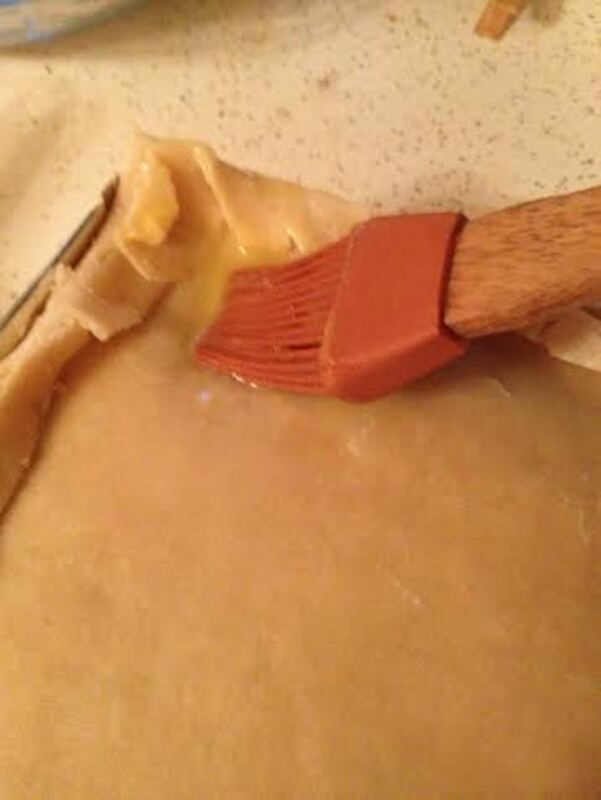 Using a pastry brush, go ahead and coat the edges of the top crust with your egg wash. Don't do the rest just yet. 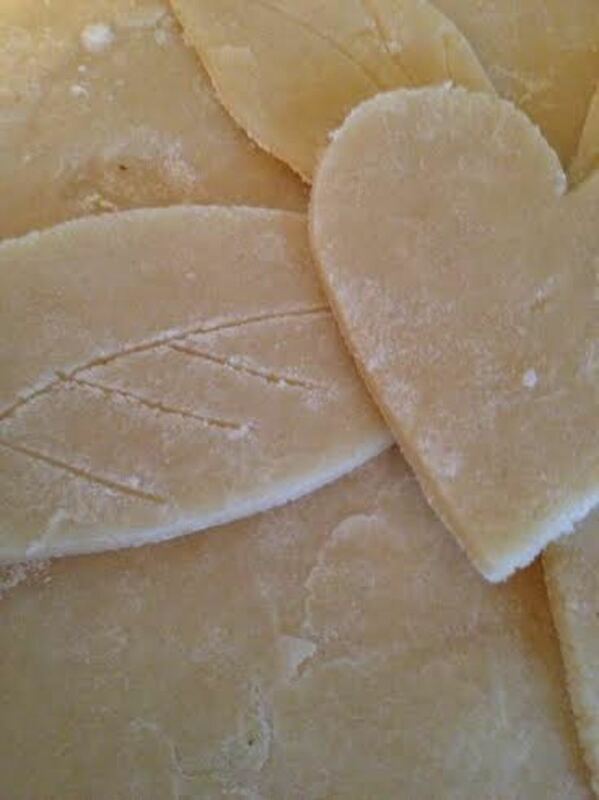 Using the egg wash as your glue, apply it to the back of your decorations and lay them in place on top of the crust. 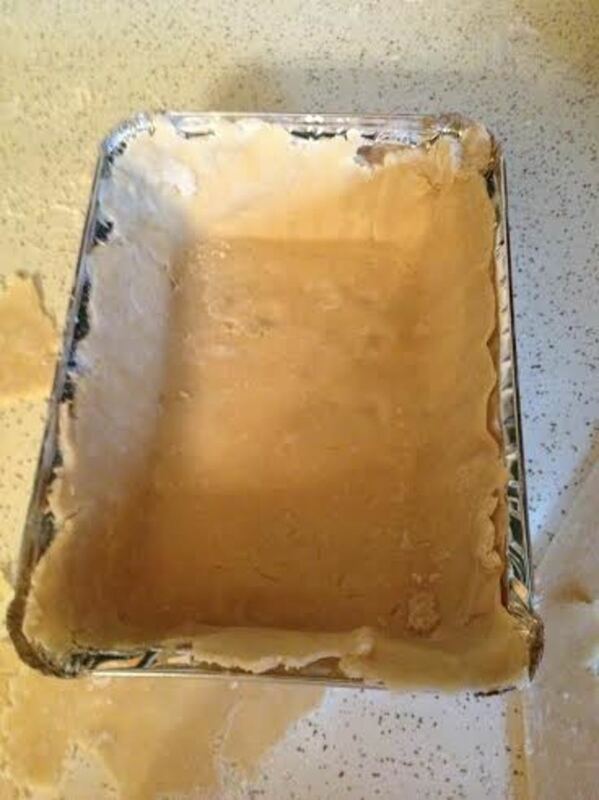 Once the decorations are in place, go ahead and carefully egg wash the rest of the top crust making sure that the whole surface has a nice, light, even coat. It should appear shiny but not saturated. 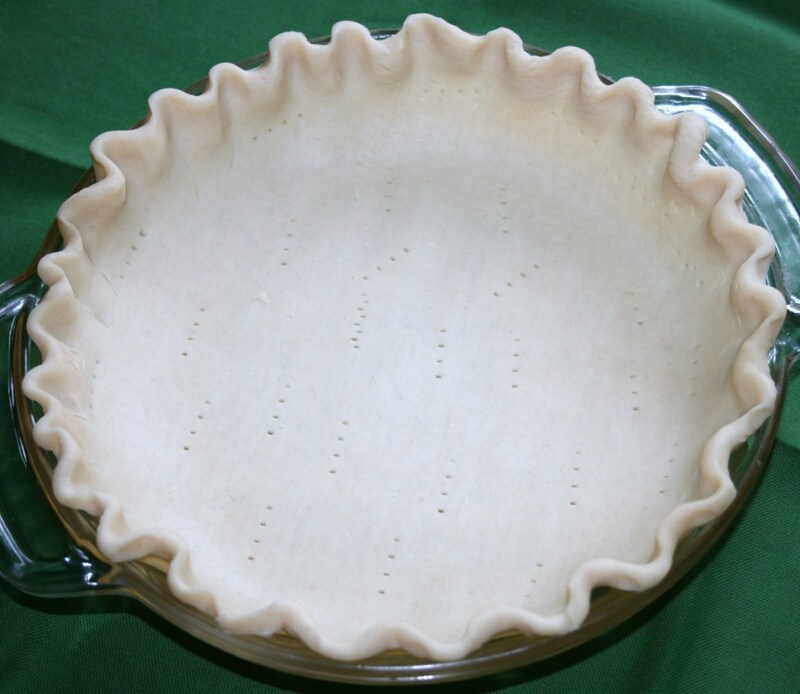 You will want to cut a few vent holes in the top crust to let the steam escape while the pie is in the oven. I cut slits about 1 inch long between the leaves and at the corners. It was probably more cuts than needed but I like to have clean topped pies and proper venting slits will keep the top clean. 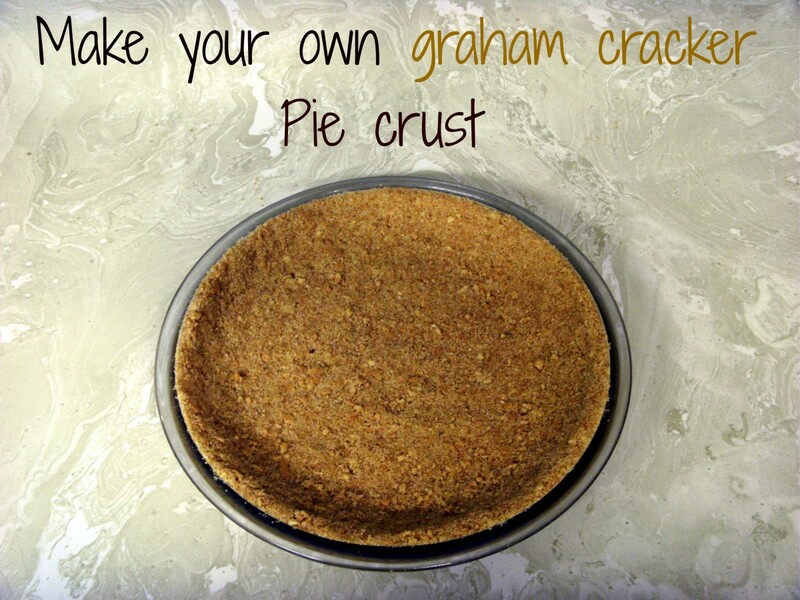 Bake for approximately 20 minutes at the same 450 degrees that you par-baked the bottom crust. 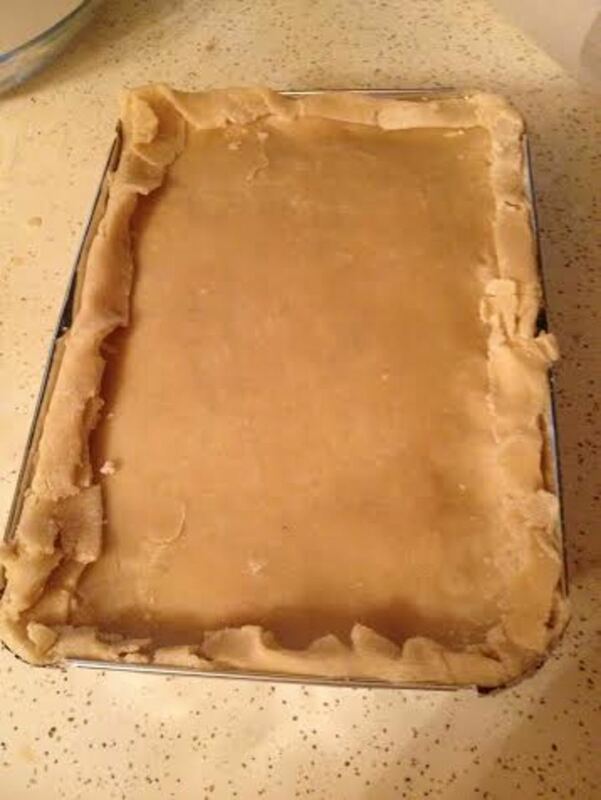 When the top crust is browned and shiny, your homemade pot pie is finished. 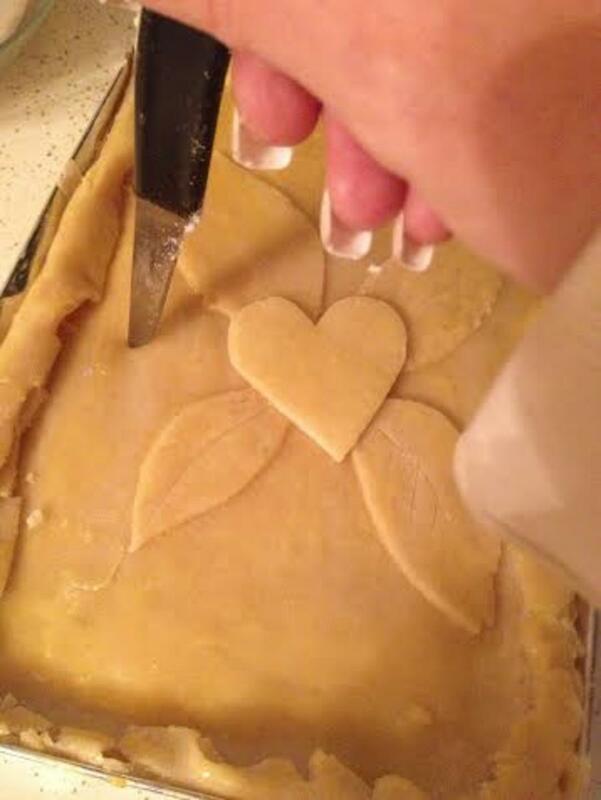 Allow to cool for 20 minutes before cutting into it. This will give the filling enough time to cool off and thicken back up. Serve with yeast rolls or bread and butter along with a green salad for an excellent, homemade dinner that everyone will love! Wow! Looks good. I must try this recipe. You made it look so pretty. Hi Helena, Your top crust looks absolutely gorgeous. I'm always jealous of really pretty crusts like that. I don't have that kind of talent. The recipe looks really good too. 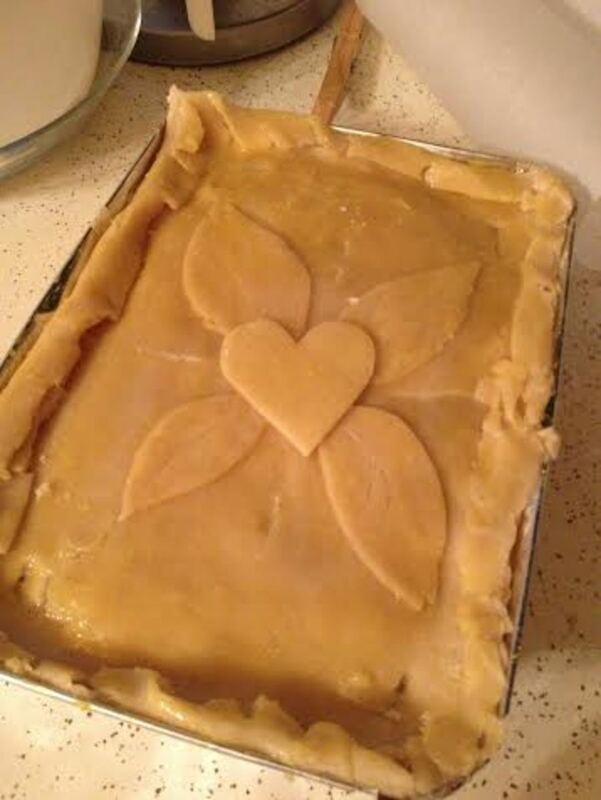 It's the first pot pie I saw in a rectangle pan. Great recipe. Thanks for sharing. 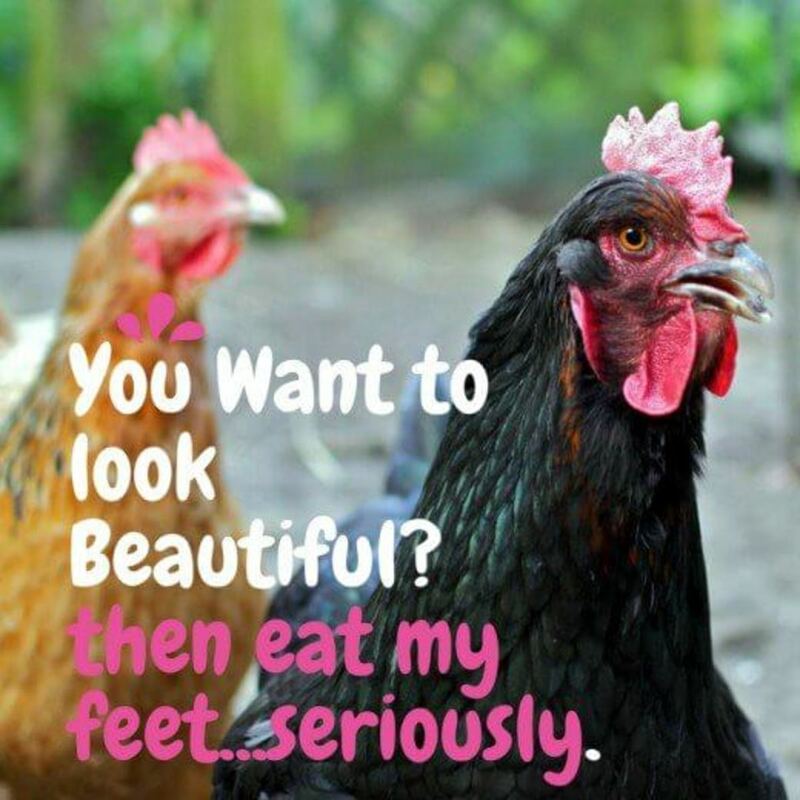 That is an excellent idea @Shades-of-truth and I will do that. Thank you! Great article, Helena. Next time you make it, cut a slice and take a photo, so we can see what it looks like on a plate. My husband would love this dish! Thank you so much! If you make it, please come back and let me know what you thought. 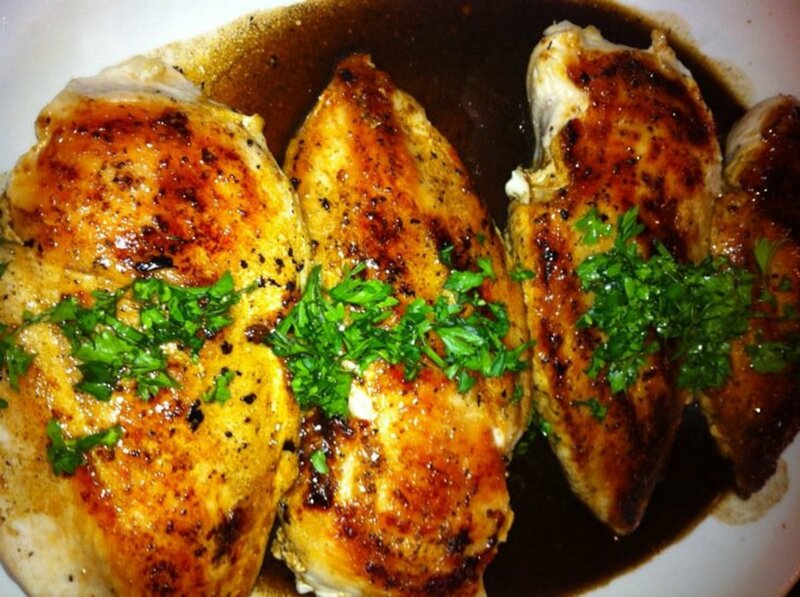 You may have just solved tonight's dinner dilemma . I think I have everything I need for this in the fridge. The detailed photos really helped, thanks. 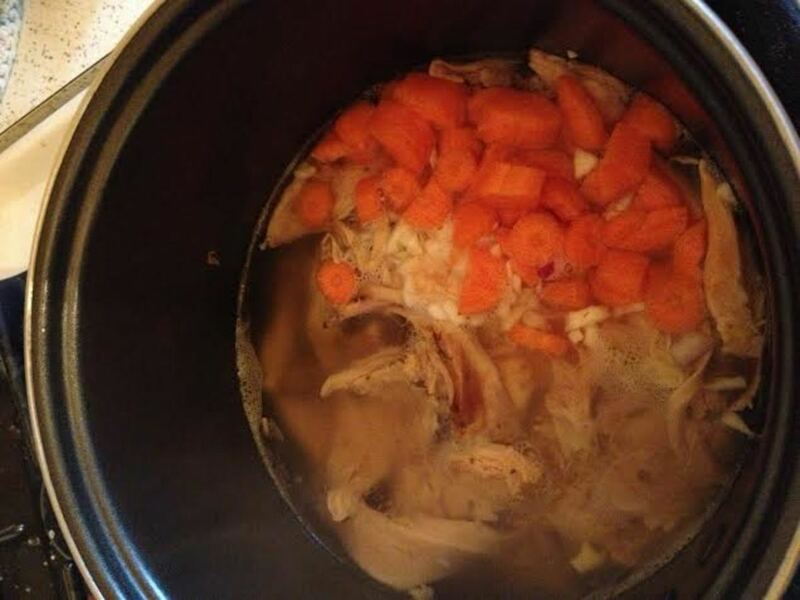 Awesome looking recipe. 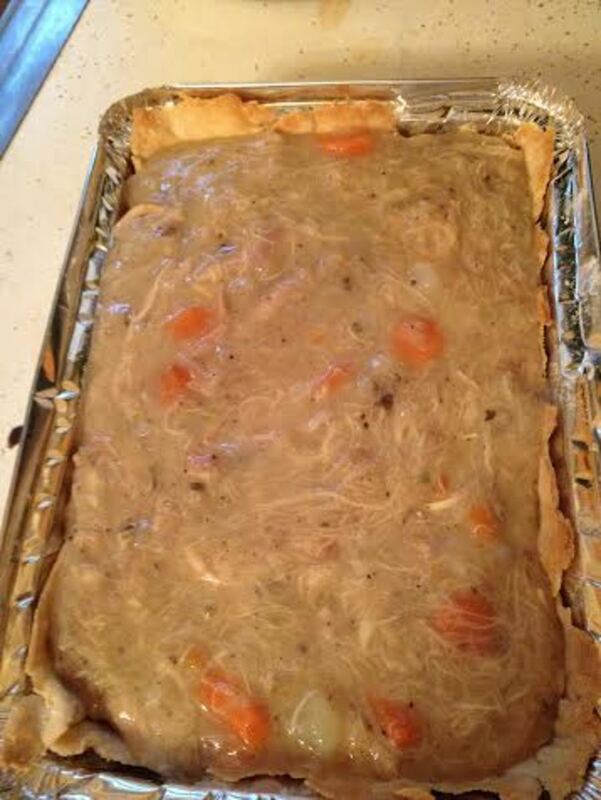 I love chicken pot pie and I was looking for a great recipe. Voted up! It is great in the wintertime! Great recipe. I plan to try this. 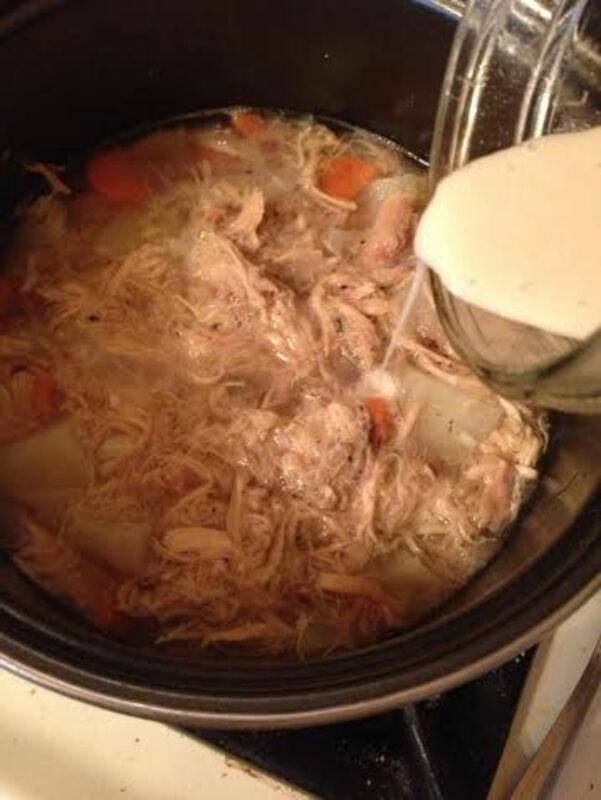 We enjoy this type of dish in the winter.